The numbers of dead and missing continue to rise in what is being called California’s deadliest wildfire. By Friday, officials said at least 63 people had died. Six hundred thirty-one people are listed as missing from the fire in Northern California. And three people are dead as a result of another fire near Los Angeles in Southern California. The Sheriff of Butte County said the number of missing people probably includes some who fled the fire. He said he is making the list public so people can let officials know if they survived. About 52,000 people have fled. They have sought shelter in the homes of friends and relatives, hotels and even in the parking lot of a Walmart store in the town of Chico. 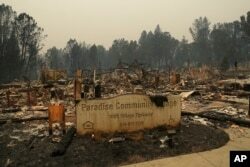 The fire in Northern California began about one week ago in Paradise, a town of 27,000 people. There is a story about Paradise. That is, how they say, Paradise was born. Over generations, thousands of people came to live there. They worked in gold mines and harvested trees from the forests. They built homes, schools, businesses and places of religion. But, in a few hours last week, much of that was destroyed. 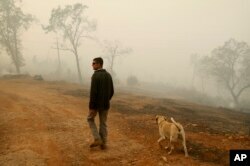 It is estimated that the fire has destroyed 9,000 homes and hundreds of businesses. The Honey Run Covered Bridge, built in 1886, was among the historic structures lost. Patrick Knuthson’s family has lived in Paradise for four generations. He pointed out the burned-out structures that were once a hotel, a pawn shop, a property office, a liquor store, and an auto repair shop, and his favorite Mexican restaurant. People who live in Paradise say children could bike to the park and go fishing in the pond. As they got older, they would play in the river or hike in the forests after school. The Gold Nugget Museum, a reminder of the town's gold-mining past, was damaged. 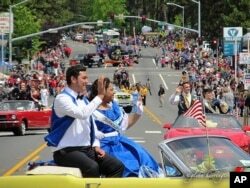 This 2015 photo provided by Glenn Harrington shows the Gold Nugget Days parade moving along the street in Paradise, Calif.
Each spring there were Gold Nugget Days to mark the discovery of a 54-pound gold nugget in 1859. The people would hold a parade to recreate how miners carried the heavy nugget into town. 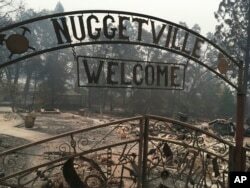 “My daughter’s going out for the Gold Nugget Queen this year,” said Krystin Harvey, whose home burned down. “Well, it’s been going on for 100 years, but we don’t know — there’s no town now,” she said. Hurst refuses to talk about the town as something of the past. Some buildings still stand, including the town hall, the 750-seat performing arts center, and the Feather River Hospital. FILE- In this Tuesday, Nov. 13, 2018 file photo a sign stands at a community destroyed by the Camp fire in Paradise, Calif.
Martha Mendoza reported this story for the Associated Press. Hai Do adapted the story for Learning English. Caty Weaver was the editor.